Sign outside a Canada Post fitting aka trial room in Ottawa. If a stranger to our customs asked me how to go about buying a shirt, I would, until recently, have told him to go to the store and look at the selection, try a couple on, select his favourite, pay for it with cash or a credit card and then take it home and enjoy wearing it. In hip 2018, I am supposed to order a bunch of shirts online, pay for them with a credit card and arrange free delivery to a destination of my choosing. Then, I keep the ones I like and ship the rest back free, within 30 days, for a full credit card refund. The idea of a retail store with inventory is fast becoming extinct. The advertisement touts the establishment of new “Concept Stores,” by Canada Post, in “select locations.” These Concept Stores are “innovation labs” that allow Canada Post to “test exciting new services so you can experience the post office of the future, today.” Unfortunately, our Wellington Post Office is not a select location, for Canada Post. Now, I am the first one to sympathize with the financial predicament of Canada Post. Its monopoly over the mail service has swiftly become irrelevant. Increasingly, people engage electronically and their parcels arrive by courier. The government expresses no interest in extending that monopoly to meet those new realities, which makes it harder to recover the costs of fulfilling Canada Post legacy mail obligations. A Canada Post office with fitting or trial rooms: what will this entail? Will you have to pay for trying on more than three shirts? Will the next logical step be to hire advisors to help you select the right tie for you? Expand use of trial rooms. Maybe the trial rooms for clothing and apparel is just the beginning. 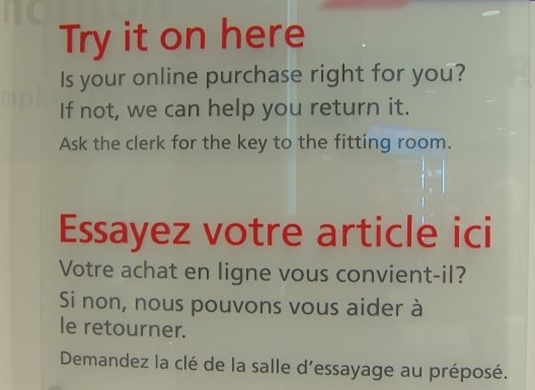 Perhaps Canada Post plans to expand its change room concept to a trial room approach for the whole gamut of good you once could buy at a retail store and can now obtain online. Anything is possible. Say you order a barbecue online. Before taking it home, you want to make sure all the parts are there and you know how to put the thing together. There’s no better way to deal with your concerns than to let you test your new b-b-q. Allowing you to do so right at the at the parcel delivery point? Perhaps, having the trail room staffed by someone that has assembled a barbecue or two before? Maybe you ordered five pounds of gourmet free-range sausage, online, from a specialty farm out west. Who wouldn’t relish the opportunity to check out the freshness of the product in a Canada Post trial kitchen? Then you could return it on the spot, if it doesn’t pass muster? While we are at it, why not staff the kitchen with a nutrition consultant. She or he can verify your conclusion regarding taste. Perhaps you might have the chance to purchase some sauerkraut and potatoes to go with it. Maybe sometime next year, when purchases have become lawful, you will have ordered online some Willie Nelson special blend cannabis. You’ll want to make sure you bought the real McCoy. What better place to test the product than in a trial room right on site. This is especially true if an experienced user were on hand to help you with the quality assessment. You could imagine almost any online product having an associated trial room. Maybe this is Canada Post’s long-term strategy. To be the hub around which the online world delivers and readily takes returns, free, both ways, to and from the buyer. Some trial rooms may hold inventory.